This combination tour starts from the visit to the Menshikov Palace. Alexander Menshikov was the closest friend of the Emperor Peter the Great and played an important role in the Russian Politics and building of Saint-Petersburg. At the top of his social and political career he was the General-Governor of the whole Ingria (the old name of the North West region of Russia), but later was accused of corruption and sent into exile. After, you will proceed to the Stae Hermitage. 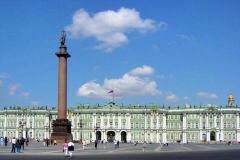 Hermitage (also known as the Winter Palace) was the home for the russian tsar’s for almost two centuries. It’s art collections boast to be one of the largest in the world.